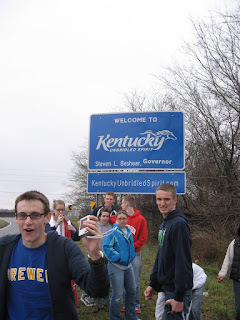 I arrived back in Jacksonville at 3:30 AM today capping off my ninth significant road trip of the past 16 months. I'm getting pretty good at 12 hour drives. I have gas stations in Indianapolis and Chattanooga that are becoming regular stopping points and have perfected the fast food and gas stop efficiency combo. These are all good skills, but my favorite road trip was easily back in the Spring of 2008. All four years of college I spent my spring breaks in Panama City Florida participating in a Campus Crusade conference there called Big Break. It's quite possibly my 3rd favorite thing in the world and by my senior year the conference's popularity had grown so much in Madison that not everyone could even fit on a coach bus, so about twelve of us volunteered to drive separately. 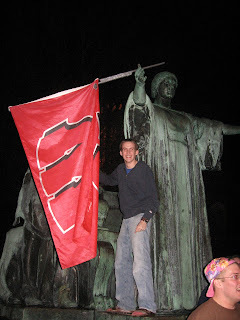 - Ran around the U of Illinois campus with a Wisconsin Badger flag claiming ownership of various campus landmarks at 4 in the morning. 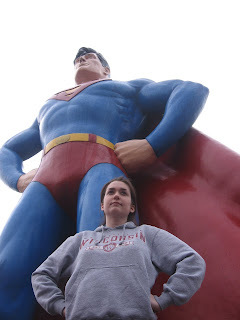 - Climbed the Superman statue in Metropolis, Illinois. - Visited the (lobby of) the Museum of the American Quilter's Society in Paducah, Kentucky. - Led many in our group to their first ever Waffle House visit. - Discovered the pricing of cowboy boots in Nashville. And this was all in the first day of the trip, but at the conclusion of this day we realized we needed to sleep somewhere . . . and we had a plan. We brought tents. Nevermind there was about 12 of us and only two tents, that wouldn't be an issue. We were a hearty bunch. So, we pulled into a state park in Northern Alabama and talked our way in even though it was about 30 minutes past the time they stopped accepting campers. The camping literate quickly set to starting fires without matches (a skill that never fails to mesmerize me as I'm more of a liter fluid dependent). And I was one of 4 people who volunteered to go tentless. The four of us remaining threw a tarp on the group and simply put sleeping bags on top of it and as soon as we had done this there was a sudden, LOUD thunder clap and the rain started. The tarp was plenty large so we just pulled it completely over our heads and made a miniature shelter. Then the storm began to increase in strength and had to be one of the three largest I can remember. Huddled under the tarp, we were laughing hysterrically. The rain was coming down in sheets and we could feel it flowing and running down a slight downhill underneath the tarp. We had to hold the top side down tightly and wind was constantly forcing openings in it and letting bursts of rain in. The lightening was so intense and so frequent that you could clearly see across the campsite as if it was broad daylight. This was intense, but in a fun way for three of us. Except, the guy on the far edge and on the highest part of the uphill. We didn't hear him laughing. His edge was the side where the wind was blowing from and his edge was the side were the little rivers of rainwater were occasionally jumping the tarp and flowing into his sleeping bag. We were relatively dry, he was drenched. I at the far opposite end, didn't know this. But I soon found out as he made a sudden break for the safety and, more importantly, dryness of a car. With this departure and deluge of water that his body had been withholding came flooding at me. Further, the wind, now unhindered blew the whole upper side of the tarp off. There was no recovering from this. We were instantly soaked and each bolted for the nearest car to spend our remaining hours attempting to sleep. It set a high standard that I doubt any future road trip will ever be able to match, but I'm open for competition. Anyone want to jump a train with me and give it a shot? How do you leave the hail and tornadoes out of that story?! The tornadoes were about 10-15 miles away. The hail pelted us over and over again. We had to make sure our face and such were protected. On top of that, the rain was freeeezing! Good point. I can't believe I left out the hail, I definitely remember feeling it.